The opportunity to work alone with a private teacher in order to improve your Spanish, focusing on your own personal interests and/or needs. Study and learn with fun! Classes: from 1 to 4 classes daily. Or, one-to-one classes in addition to a group Spanish course. Timetable for your one-to-one Spanish course: before 10 or after 13.30. Content of the one-to-one Spanish course: whatever you like. 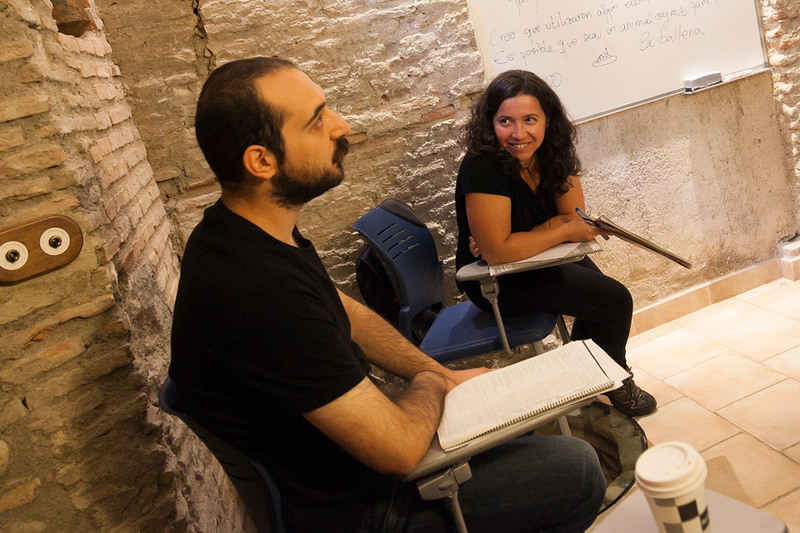 In the one-to-one Spanish course, you decide the content and topics, the start date, the length, and the intensity. Before you begin your one-to-one Spanish course, you can send us details of what you would like to cover, so that we can prepare a programme suitable for your requirements or wishes. You can begin a one-to-one Spanish course any day of the week, have the number of classes that you wish, and study the topics and/or grammar points that you need to practise. Our one-to-one Spanish courses are suitable for students of all levels, from absolute beginners to proficient users. You progress at your own pace, and you can discuss your aims and requirements with your teacher. You can even have your one-to-one Spanish class in a bar or in your hotel (with a supplement). Individual Spanish classes of 45 minutes each. The organisation of a varied programme of activities 5 days per week. Free wireless internet access for laptops. Those who are short of time or have a schedule that makes the fixed timetable of group classes inconvenient, but who wish to make as much progress as possible. Those who want a personalised approach in order to be able to learn as quickly as possible. Those who want complete flexibility: with regards to both the content and timetable of their Spanish classes. Those with specific requirements: professional needs, hearing problems, etc. Those who want to increase their confidence in using the language, or who may be too shy to ask for clarification in a group situation. If you are preparing for an exam in Spanish (whether it be in Spain or in your own country), our one-to-one classes for exam preparation are ideal. You can send us the syllabus of your course, or a list of topics for your examination, and we will prepare a custom-made course to fit your needs. Be prepared for you exams! The content of your studies is not important: it could be related to Spanish literature, linguistics, or grammar; it could be Spanish for a specific professional field, or it could be any other topic that is related to the Spanish language: we adapt our one-to-one classes in order to best prepare you for your exams. An advantage of one-to-one Spanish classes for exam preparation is being able to focus on what you need to study. You will have your teacher’s undivided attention: you don’t have to follow the pace or the interests of others, as you would in a group class. One-to-one classes are adapted to your level, your pace, and your goals. As well as the content and pace, you choose the number of one-to-one classes and the length of your Spanish course for exam preparation. If you only have limited time to prepare for your exams, or you feel that you need a lot of practice, you can choose to have up to 4 classes per day.